IS ROMA CULTURE A SUBCULTURE, DAMAGING MAINSTREAM CULTURE? - World Artists Initiative "Khetanes"
On 2 July 2014, The Romanian Peasant Museum in Bucharest opened its doors to host an exhibition of paintings, called “Confluence, influence – in art?”. All paintings have been made by the Roma painter and sculptor George Mihai Vasilescu, also present on this Khetanes site and member of the Visual Arts and Paintings Group. The exhibition of paintings of manele musicians, that will last until 8 July 2014, caused a stir in Romanian press and social media. The director of the museum, Virgil Stefan Nitulescu, was even asked to resign, by - among others - Bogdan Dianocu, a Romanian politician, who started a campaign on his Facebook page. The painter himself received threats. The feelings started running that high that foreign press got involved. Le Huffington Post (Canada), die Welt (Germany) and France Press report about “continuing insults and threats” and “hate-speeches against exhibit”. George Mihai Vasilescu is not an amateur. He exhibited his work in Graz, Austria, Strasbourg, France, and in the Galerie “Kai Dikhas” in Berlin, Germany. Recently the painter made a series of portraits of famous manele artists, vocalists as well as musicians. Manele is a music style in Romania, divided in classical and modern manele. The classical manele are a Turkish-derived genre, performed by mostly Romani musicians (Wikipedia). With oil on canvas and gold leaf, the painter portrayed Florin Salam, Adrian Minune, Vali Vijelic and bands like Taraf de Haïdouks. Artists that are also very popular among Romanians and whose music can be heard in disco’s all over the country. So far all okay. The problems arose, when it was decided that the exhibition would take place in The Romanian Peasant Museum. This institution is dedicated to Romanian culture, has some rooms where usually contemporary art exhibitions take place and is one of the highlight spots in Bucharest. Roma culture “part of” or “against” Romanian culture? Should this museum host portraits of manele singers and gypsies? The director, Virgil Stefan Nitulescu, fully backed the artist and stressed the freedom of artistic expression. He, Nitulescu, will not stop the exhibition, there is no place for censorship, he states. Also the curator of the exhibition, Pavel Susara, a top art expert in Romania, supports the painter. Many other Romanians, however, commented that this exhibit would harm the national image. They call Roma culture a subculture, a culture of belly dancers, and they make fun of their foreign critics in Germany, France and elsewhere, who accuse them of racism. Would the French show these works of art in the “Louvre”, would the Germans show them in their “Altes Museum” in Berlin? Also Bogdan Diaconu, the politician who takes a lead in the anti-campaign, denies that he goes against an ethnicity. It is the subculture and its music that he focuses on. But The Romanian Peasant Museum is not performing concerts, it is exhibiting visual art! If painters are only allowed to paint what the audience pleases, museums worldwide would be empty. Also in Romania, Roma live in social exclusion, in isolated places or surrounded by walls. Art, however, is free. It cannot be socially excluded, even it if reminds us of the existence of co-citizens whom we try to ignore. That seems to be the real problem in Romania, and unfortunately not only there. On this site, where art has a major role as a motor for creativity and better understanding, comments by collegue artists, museum directors, curators and media experts will be highly welcomed! In Bukarest haben Nationalisten versucht, eine Ausstellung des rumänischen Malers George Vasilescu mit Porträts von Roma-Musikern zu verhindern. Eine Kunstausstellung zum Thema Roma hat in Bukarest eine Flut rassistischer Drohungen ausgelst. The director of Bucharest's Museum of the Romanian Peasant, Virgil Nitulescu, has received a death threat via e-mail over paintings of Roma musicians. Beginning of August, it was decided that "Khetanes" would start an open letter campaign. Within less than one week, 29 artists, scholars and activists decided to co-sign. We publish the text of the letter here, with the names of the first co-signers and those who joined later. If you want your name to be added, please, mention this in the comments of this blog. Regularly new names will be added to the existing list. In September, TV broadcastings will again pay attention to what happened in Bucharest. Also in September we will further distribute this letter. Freedom of the arts is a dear principle, and not only in Romania. We will defend it anywhere and we count on your support! Is Roma culture a subculture damaging mainstream culture? Censorship is a complex head with different sides to its face: an official side based on law and an unofficial side based on fear and manipulation. Both sides are closely related. Under Nazi rule, in the 1940s, books were banned and swing music was forbidden in Europe. In the second half of that century, communist censorship silenced dissident artists. Today most Europeans live in the area of the EU Charter of the Fundamental Rights and its article 13: Freedom of the arts and sciences. Yet we see again censorship, the unofficial variant! Do we resign and accept practices that are fatal to art? The Romanian painter George Mihai Vasilescu is not an amateur. He exhibited his work in Austria, France, Bangladesh and in Germany, in the Gallery “Kai Dikhas” in Berlin. Recently the painter made a series of portraits of famous manele artists, vocalists as well as musicians. 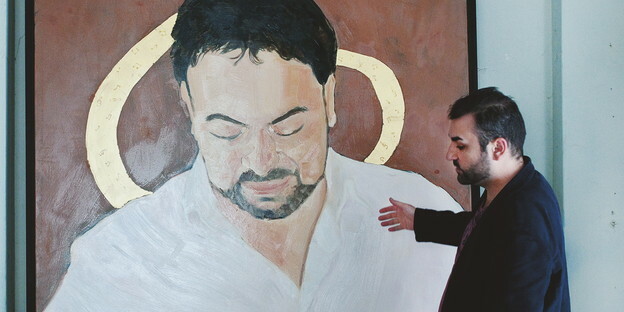 With oil on canvas and gold leaf, the painter portrayed Florin Salam, Adrian Minune, Vali Vijelic and others, and also renowned bands like Taraf de Haïdouks, stars at international music festivals. From 2 July – 8 July 2014, the Romanian Peasant Museum in Bucharest hosted an exhibition of Vasilescu’s work, entitled “Confluence, influence – in art”. Four national Romanian TV channels and written media reported on the event. Also foreign press got involved. BBC for example was interested for making a documentary on the very musicians that the painter had portrayed. Other foreign media, from Germany, France, Austria and Canada, stepped in because of a smear campaign against the exhibition and the director of the museum, that had nothing to do with art. Local Romanians protested against portraying musicians from a Gypsy “subculture” in their mainstream culture museum. The exhibition should be closed, and the director (who received death threats) should quit his job. Protesters called it a scandal to exhibit portraits of Gypsies. Luckily the director, Virgil Stefan Nitulescu, refused “to censor art”. And also the curator, Pavel Susara, a top art expert in Romania, fully backed the painter. Both stood firm during the insulting Facebook campaign by Bogdan Dianocu, a Romanian politician (social democrat party). Meanwhile the exhibition is over, the artworks have been stored in a room not accessible for audience, but the campaign went on… Two days after the closure of the exhibition, Prima TV (national television) made a short documentary for which the painter and Vadim Tudor had been invited. Vadim Tudor, President of Romania Mare, (nationalist, far right party) and Member of European Parliament, called the painter “talented”, “a big promise” even, but also advised him to paint more serious themes… And Vadim Tudor underlined that the Romanian Peasant Museum was not the right place to exhibit. In the final documentary, broadcasted on 10 July, this was the major message, due to cuts by the makers. In brief, according to the protesters, a Romanian culture museum should not offer room for what a majority considers to be a “subculture”. The word “sub” stirs up another word “superior”, exactly the way the word “unter” stirs up the word “über”. Do politicians again have the right to decide what is “sub” or “superior”? What is serious and allowed, and what is inferior and must be banned? And we, colleague artists, curators, directors of museums, journalists and legal experts, what do we do? Do we resign and accept a censorship that is violating fundamental rights and is fatal to art? Those who do not resign, please sign this open Khetanes letter! May, 2015, George Vasilescu was invited to come over to the Netherlands in order to attend the International Gipsy Festival, where 10 huge banners (2 x 2 m), each with prints of his paintings, were going to be exhibited in the large Festival garden. Amongst Vasilescu's works are the pieces of art, shown in the Peasant Museum in Bucharest in summer 2014. One of his works is a portrait of the Romanian band "Fanfara Ciocalia". During the Sunday programme of the Festival (31 May), Fanfara Ciocalia will perform with the Canadian guitar player Adrian Raso in a show called "Devil's Tale": a very special mix of Balkan brass and Gipsyjazz. It was Albert Siebelink, director of the Festival, who invited George to exhibit his paintings. The Romani artists whom the painter has portrayed, happen to be famous and much appreciated musicians at the International Gipsy festival in Tilburg e.g. Taraf de Haïdouks (2014) and Fanfara Ciocalia (2015). The opening of the Festival was done by Marcelle Hendrickx, Councillor of the City of Tilburg. And then there was a surprise: the councillor presented a portrait in oil of Albert Siebelink, made by George Vasilescu. On the photo Albert is showing the portrait to the press. With the portrait, the city of Tilburg welcomed the cooperation between Albert Siebelink and George Vasilescu. CONGRATULATIONS, George, for visualizing and manifesting such an impactful exhibit! It certainly advanced a much needed conversation about tolerance. I am thankful you and Pavel and Virgil are safe and sound. How scary to receive threats. Thank you for being brave and focused on the art in the face of adversity. Keep putting safety first. Thank goodness for people like Els, and members of the foreign press, for filing reports so the insults, threats, and hate speech now have been publicly documented. Is Roma culture “part of” or “against” Romanian culture? Humbly, I suggest that if the government of a nation wants a) to keep its youth/citizens safe and sound AND b) to remain unified, then it is equitable, dignified, and just that every nation’s culture museum feature glorious exhibits about all the different types of people there. Should the museum host portraits of Gypsy manele singers? Should is a guilt inducing word, but, yes, it should, and, thankfully, it already did!! Good job, George, Pavel and Virgil!!! Also humbly, I propose that human beings that make fun of other people OR say things like “Roma culture is a subculture, a culture of belly dancers” are acting mean. Eventually, their damaging argument will be disqualified, deemed irrelevant in our minds AND within proper public forums. Making fun of another person and saying that certain people are “sub” can both be classified as mean, certainly parents, teachers, preachers, doctors, lawyers, and others would agree. Moreover, racism is another way to say acting mean, so since the subculture comment is mean and involves race, then it can be considered an example of racism. I’ll close with these thoughts. My Mom says, “If you cannot say anything nice, do not say anything at all.” Why? For so many good reasons that we have all heard about since we were children, but Ice Cube's simple sentiments sum it up for now: “check yourself before you wreck yourself”. I have emailed you as well, but please add my name to these signatures. but this doesn´t make us a subculture in the very negative sense of this word. What it's really incredible is because the museum show a painting exhibition and not a concert!!! The painter is free to paint what he want, even he paint roma singers. In the 21 Century happens this, it's for shame, we don't have our country but the country where we live has to be proud of us that we product positive things not just for the Rroma people also for the country. Well done pralla show the good things that also we can organize something for our people . strange how musicians can be loved abroad and celebrated as a fine example and representative of their country and not liked by their fellow countrymen. I only take Taraf de Haïdouk, for I've seen them perform in Tilburg, Holland and in Samois, France and even in an early Tony Gatliff movie. Great original musicians at every venue in the West gaining massive rounds of applause. And now a painter found it in his mind and heart to portray them proper and put the painting on display for all to see. Strange that fellow Romanians try and prohibit him doing so. Seems there is some misunderstanding going on, toput it mildly. Maybe, to concur with the political idea, the museum that was sought out to do the display was not the correct one, maybe a different museum should have the honor. For instance, you don't put a Rembrand on display in a museum for ancient letters of futuristic cutlery. Then, feet back on earth, this is of course just the beginning of an anti campaign that only starts here. There is some jealousy present, these musicians being asked to perform abroad and earning actual money can aggrevate a not well earning politician. In short, I hail you salutes painter and museum director for your bravery, how ever shortlived the exhibition was in the end, your stance made world news. Let art be present in an art-museum and if paintings of musicians are among that art, then them too have to get a proper museum wall on which to hang and be shown to the public. No censorship should be allowed to rule out that right. The museum director should be the one person (with his staff) to program an exhibition and no political influence should interfere. Els, you can write my name down on the signed list. Yes, please add my name to this list. I FULLY support you. Patrick Jasper Lee, author, artist, composer. Thanks, and kushto bok with all your campaigns.